Of all of Anthony Bourdain's nasty passages, the opening chapter of A Cook's Tour is still, for me, the most indigestible. Having never before seen an animal slaughtered, Bourdain visits a small family farm in Portugal, where men cleave a thrashing pig, "working the blade back and forth like a toilet plunger." I wish I'd written that. But a more eloquent description of the butchering of a sheep can be found in The Blue Sky  the short 1994 novel by Tuvan chief, poet, shaman and storyteller Galsan Tschinag. Raised on the wild steppes of northwestern Mongolia, near the Russian and Chinese borders, he, unlike Bourdain, is no stranger to slaughter: "And then I saw the hand drop the knife and thrust, with fingers straight and pressed together, into the slit as a hawk charges at a sparrow." 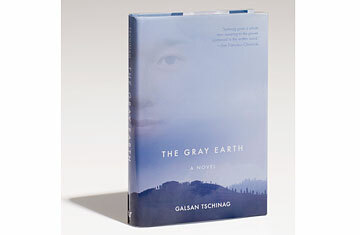 Intimations of mortality are among the grand themes of both The Blue Sky and The Gray Earth (1999), its plangent sequel, recently published for the first time in English. The two volumes are part of Tschinag's loosely autobiographical trilogy, set in the 1950s and recounting both his and a recently formed People's Republic of Mongolia's stuttering growing pains. The Gray Earth picks up right where The Blue Sky ended, with protagonist Dshurukawaa, a shepherd boy, raving and grieving over his beloved dog, who perishes after eating poisoned bait set out to trap wolves and foxes for a state pelt quota. As the novel begins, Dshurukawaa, born in the Year of the Horse, is still as buckingly antiauthoritarian as an 8-year-old can be  a Tom Sawyer of the Steppe. Mark Twain's shoeless stinker had a corncob pipe; Dshurukawaa puffs one of sheep bone, filled with a repellent mix of rabbit dung and native herb, convinced he's a soothsayer. "I smoke it before I shamanize," explains Dshurukawaa to his angular half brother Dshokonaj, come to fetch him away from the family yurt in the Altai to a state-run boarding school, where he is the principal. There, the theory goes, Dshurukawaa and other Tuvan kids will have the steppe stepped out of them. With proper learning, they'll no longer be nomads but "civilized," settled citizens of a modern nation. It's the familiar discourse of empire, espoused by an advancing foreign legion of Orwellian proper nouns: School Collectives, Comrades, Bureaus, District Administrations, the Party, the State, the National Flag, the Mongolian People, the Motherland. Gone are tradition, brass butter lamps, holy juniper water and neck-bone relics. In their place is a "square world" of concrete buildings lorded over by Marshal Choibalsan, the Stalinist Prime Minister. His death, compulsorily mourned, precipitates a series of tragic "offensives" conducted in the name of modernization, including the sawing down of a grove of divine larch trees. That is led by Arganak, a jaundiced, sycophantic overseer of district affairs, but Dshurukawaa's nemesis from a time when he worked at Dshokonaj's boarding school and beat Dshurukawaa for dirtying his state-issued uniform. In lesser hands, The Gray Earth would be an easy screed against globalization or a boring jeremiad against environmental vice. Tschinag leans in those directions, but his authorial voice never drowns out that of his brilliantly complex boy narrator. Trickster Dshurukawaa makes this book, defamiliarizing things to make the alluring ordinary, the ordinary alluring. Blackboard scrawls of chalk? "They are funny-looking tracks," he thinks, "not at all like the animal tracks I know, of fleeing rabbits or playing squirrels." As a possessor of shamanic powers (he divines the location of a missing student, but the feat is kept secret as religion is officially outlawed), Dshurukawaa knows both the old and new can coexist. To what extent they will in the final panel of Tschinag's dazzling (so far) Mongolian triptych is hard to say. It could be years before The White Mountain, published in 2000, is rendered into English from Tschinag's written German. But I'd well reward the shaman who could do it right this instant.